A Pulitzer Prize-winning photographer who has documented Latinos’ experiences in the U.S. for more than four decades will give a presentation at Indiana State University. José Galvez will present “Shine” on Oct. 8 at 7 p.m. in University Hall Theater. Galvez will discuss his time documenting Latinos’ experiences living in the United States, incorporating his own life starting as a young boy with a shoeshine box to working his way up to becoming a photographer for the Los Angeles Times, where in 1984 he was part of a team that won a Pulitzer Prize for a series on Latino life in southern California. Through the years, he continued documenting Latinos’ experiences in the U.S. Galvez’s presentation is free and open to the public. Galvez will spend the day meeting with different groups of Indiana State students, providing insights from his personal and professional experiences to teach them. He also will have a collection of some of his photography on display as part of the visit, Ortega said. Galvez’s visit to Indiana State is sponsored by the Hispanic Student Association and the Hispanic Organization for Leadership and Advocacy. A new program at Indiana State University is bringing two alumni back to campus. Indiana State’s English department has established the Theodore Dreiser Visiting Writers Series and for the first two years alumni will read from their published works and sign their books. Josh Green, a 2003 graduate who majored in journalism and minored in creative writing, will kick off the series with his collection of short stories titled “Dirtyville Rhapsodies.” Green’s reading, signing and reception will start at 3:30 p.m. Sept. 25 in the Schick Lecture Room of Root Hall (A-264). It is free and open to the public. Released in May, “Dirtyville Rhapsodies” received praise from critics and landed on Men’s Health Magazine’s “Best Books for the Beach” shortlist, alongside works from Stephen King and Dan Brown. Green said he was eager to return to Indiana State. “What I learned in the English department was invaluable,” he said. “It directly informs my work on a day-to-day basis, all these years later.” Green said he set some of his stories in Indiana locales – including a Terre Haute factory – although, most of the stories grew from life in Atlanta, where Green has lived since 2007. Malone described it as a pleasure to return to Indiana State and to Terre Haute. Malone was born in Rolla, Mo., and grew up in both Missouri and Kansas. He attended Ottawa University before studying creative writing at Indiana State. Malone is the author of four previous collections: “Seasons in Love,” “Under the Sycamore,” “23 Sonnets,” and “Poems to Love and the Body.” In addition to his involvement in several small business ventures, Malone teaches film courses at Missouri State University- West Plains. 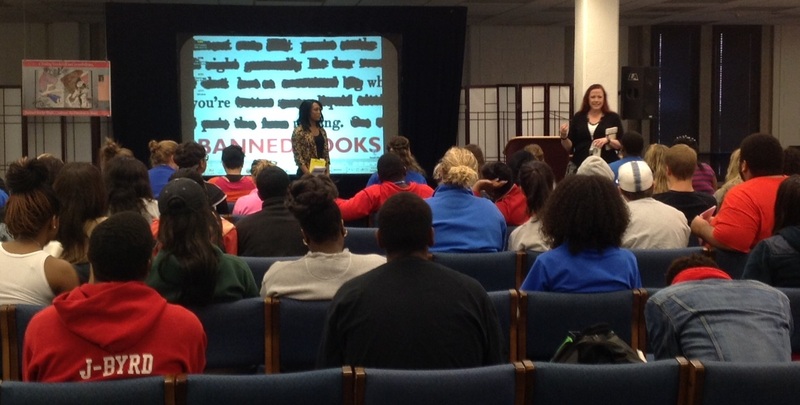 Cunningham Memorial Library will be the site of several events for this year’s Banned Books Week (September 22-28, sponsored annually by the American Library Association). 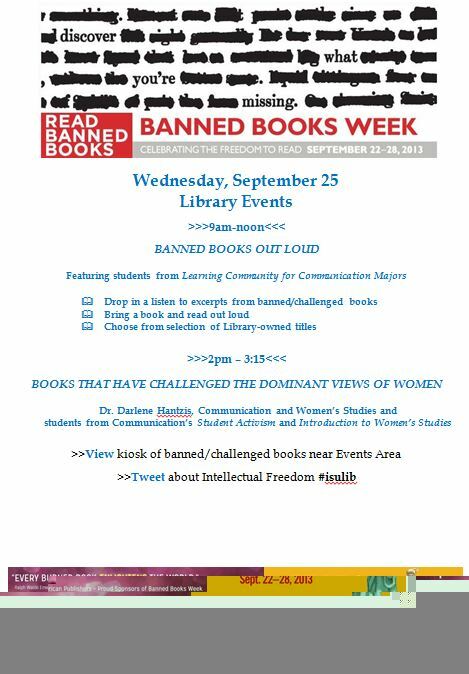 Celebrating the Freedom to Read, the traditional “Banned Books Out Loud” will take place on Wed. Sept. 25, from 9am-noon. Everyone on campus is invited to stop by the Library Events Area, sit and listen to people reading out loud from books that have been challenged or banned from libraries, and select from available books to do some reading of their own. People are welcome to bring books that they know have been challenged. 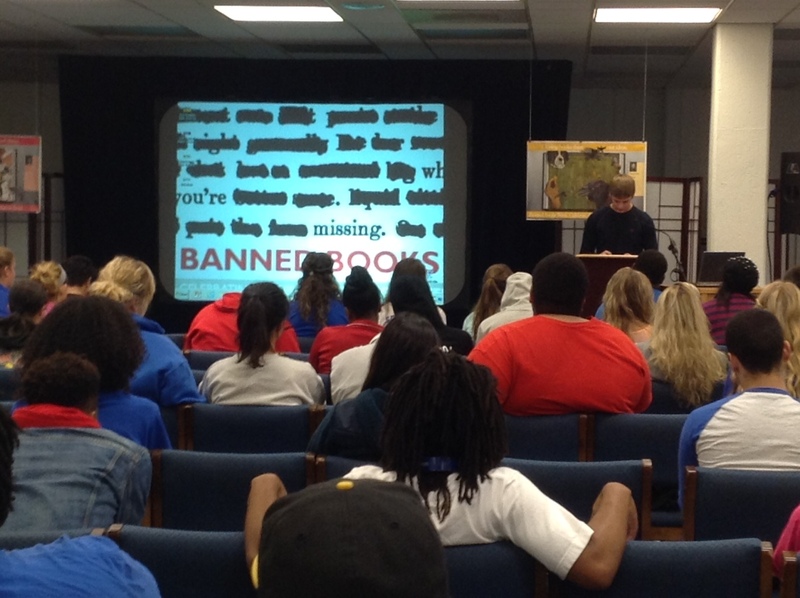 You can identify, and be surprised by, some of those titles by visiting the Banned Books Week LibGuide at http://libguides.indstate.edu/BannedBooksWeek. 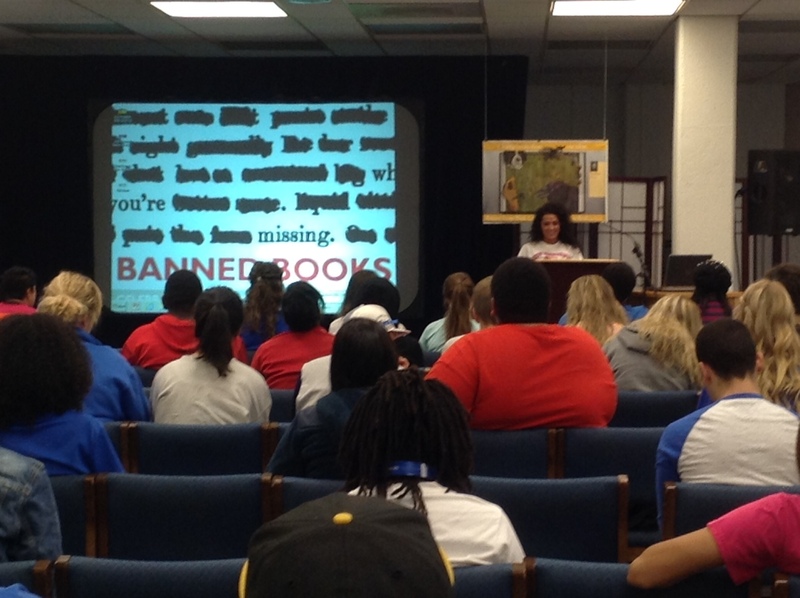 View a video of library staff, doing this year’s Banned Books Week Proclamation. Students from Darlene Hantzis’ courses will be featured: between 9 and 11am Learning Community for Communication Majors will be reading out loud. From 2pm – 3:15 pm Dr. Hantzis will lead a discussion on books that have challenged the dominant views of women, with students in the Communication Student Activism and Introduction to Women’s Studies classes. Both events are sponsored by the Library, the Communication Department and the Women’s Studies Program. A kiosk featuring challenged/banned books will be on display throughout the week and people are invited to pick up a booklet with a bibliography of challenged/banned titles as well as books dealing with censorship issues. 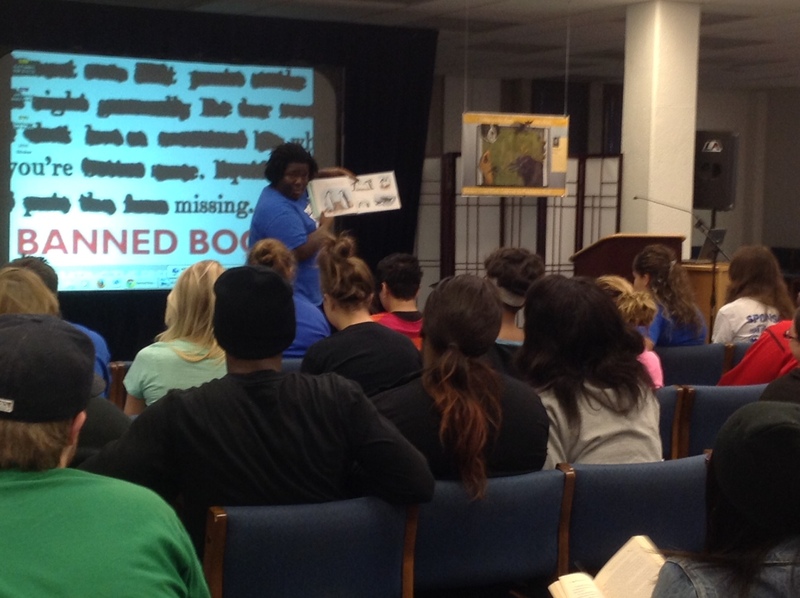 Consider tweeting your thoughts on the freedom to read via #isulib. Heather Rayl (Emerging Technology Librarian, Systems) will be presenting two workshops on the Open Educational Resources Strategic Plan Initiative this week. Although the information being presented is geared toward teaching faculty, all are welcome to attend to find out more about OERs, and how they are being implemented on campus. Both the workshops will have the same information. Sarah Edwardson from OIT has scheduled MySAM training workshops (for campus staff) in room 230 on the following dates and times. Program from the Student Health Promotion / Student Counseling Center staff about the signs of suicide and how to help a friend. 9/17/2013 – Constitution Day – Dr. Lori Henson, Communication Department, Freedom of Speech 2013 (9:30 am – 10:45 am): As part of our annual teach-in observance of Constitution Day, join the Communication Law class in a discussion of the status of the first amendment. 9/17/2013 – American Democracy Project Event: Constitution Day – Bob Van Sickel’s Supreme Court Preview (Noon – 1:00 pm): Dr. Bob Van Sickel will share his insight into what will most likely be heard by the Supreme Court when it opens in October.